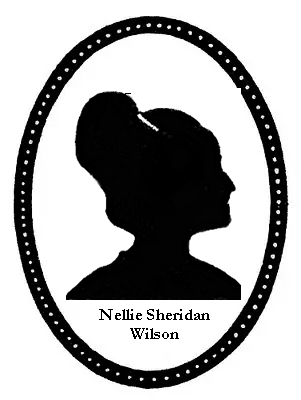 Nellie Sheridan Wilson was an amazingly accomplished woman in her day and by the looks of her last will and testament, which she drafted in 1943, she was just as shrewd of a business woman. She owned the building that was her former post office and rented it to the Underwood family (current owners) prior to the sale after her death. The building sold for ten thousand dollars at that time( it was appraised at eight thousand..she even profited after death). Of course, this was long after the post office had moved to another location and she was no longer the postmistress. This building, per Jim Young, was the former site of the Brehm and Wilson, later Johnson and Wilson clothing store. It was the place where every young man bought formal attire for prom, weddings, or special occasions. In a rural community, most were engaged in agricultural and perhaps only wore a suit on Sunday or special occasions. This store was the business of her beloved and departed husband, Thomas Wilson, who obviously loved Nellie enough to see to it that long after his death that she would be well provided for. When one thinks of this tender man, who probably knew that death was near, making provisions for Nellie, you cannot interpret their love any other way. They were pragmatic in their approach to life and death. The two lovers found a loophole in the law. Nellie,who could not be a married woman and retain her position as postmistress not only kept her job after her husband’s death, despite many clambering for her position, but actually rented the building to the postal service! Nobody could really tell her that she couldn’t show up the day after his death..it was her property. In addition, she also owned eighty-three shares of the American Telephone and Telegraph Co., valued at $12,450.00, a handsome sum in 1947. Nellie was one smart little cookie cutter! Records indicate that Dr. Bode of Rushville Ohio was her doctor. Dr. Bode was a dear, sweet old-time country doctor who still made house calls in the late 1970’s/early 80’s. If a child skinned a knee or fell off of a bike, there was kind Dr. Bode! Her will also stipulated that the sum of one hundred dollars, ninety-three after inheritance tax, be given to Fr. McCafferty, of Holy Trinity Church ,for Masses for the “repose of the souls of the John Sheridan family.” When Nellie died, she was placed in a death shroud as per Irish tradtion.